Could Yahoo Launch a Smarter Instant Search? Google has received a great deal of attention recently for immediate updates to search results while searchers type query terms into the Google search box. Yahoo was granted a patent on a similar process this past March, but there seems to be a difference in Yahoo’s approach to Instant Search. Instead of updating search results for every letter typed for a query, the Yahoo process may only show updates when Yahoo believes those might provide meaningful results to a viewer, before a query is fully formed. Providing a speculative search result for a search query prior to completion of the search query. In response to receiving a search query from a client node, a speculative search result is provided to the client node for the search query prior to receiving an indication from the client node that said search query is completely formed. The speculative search result may be displayed on the same web page on the client node as the search query, while the search query is being entered by the user. As the user further enters the search query, a new speculative search result may be provided to the user. Under the Yahoo process for showing search results before a searcher is finished typing a query and clicking upon a search button, the search engine might look for signs that a not-yet-submitted search query meets certain criteria for starting a search. That criteria is referred to in the patent as “speculative search initiation criteria”. The idea behind waiting is to attempt to limit instant, or “speculative” search results to highly relevant results. One criteria might be that a searcher has entered what appears to be a complete word in the search box. Another might be to show results for partially completed words in queries where returning results for those partially completed terms might potentially yield relevant results. In addition to looking at the letters that are typed into the search box, the search engine might pay attention to the rate of speed at which someone is typing to determine if it should launch a speculative set of results. Typing in certain characters, such as pressing the space bar might also be a signal to start a search. Another technique that might be used is to determine if what is shown in the search box matches a term or phrase in a predefined dictionary filled with popular queries, as a condition for launching a search. The patent describes a “relevance threshold” that it might try to meet before beginning to show query results. When you perform a Google Instant search, it starts showing results for every letter that you type. Chances are that you may not care too much for the results that start showing in Google’s results for the first letter or two that populate their results. Chances are that those really aren’t relevant for what you may be trying to find. Should Google back off on showing updated results that quickly? The patent does provide some more details on how Yahoo speculative search results might appear, but stresses that search results might not be updated with every keystroke made, the way that Google Instant results are presently. Following is a sequence of screenshots showing updated search results from the patent. In the screenshots, the results aren’t updated after each character typed in the search box, and the results show are very limited – mostly to just one link. 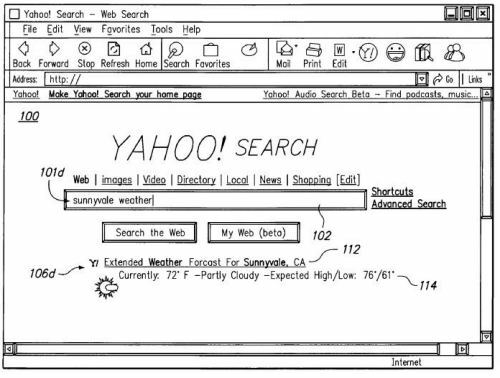 There’s no guarantee that Yahoo will start showing speculative search results, as described in this patent, but the approach indicated within the patent shows more restraint than Google provides with their instant results. Would you prefer to see Yahoo’s approach to instant results, or Google’s? Is Yahoo’s approach, as described in this patent, a smarter approach, or just one showing more restraint? After all, Google continues to show ads in their instant results, while there isn’t a single ad to be seen in the screenshots above. Yahoo does have a pending patent application, Search entry system with query log autocomplete which describes how they could locate and display drop down query suggestions similar to the ones that Google presently shows. Those query suggestions could be used to show more possible speculative search results than the limited examples in the screen shots above. Perhaps there’s a better balance somewhere between the two? Do we really need to see search results for single letters like Google is presently showing in Google Instant? Whatever Yahoo can do to improve on the monstrosity that Google has created with instant would be much appreciated! Google instant slows down my searches, and usually steers me in a direction that I do not want to go in. The main problem I can see with the search algorithm you’ve outlined is that it would give an emphasis on keywords with greater search volume. Yahoo can ‘predict’ what you’re searching based on either (1) relevance or (2) search volume. We haven’t gotten far enough with the semantic web to do (1), so I’m guessing they’ll go with (2). This is an obvious disadvantage for long-tail keyword optimizers. I think Yahoo’s approach is more user-friendly, because as Mike said, Google’s method slows down searches with a large number of irrelevant results at the beginning of a query. In regards to ad revenue, their method is more effective though since the intermediate results still show ads. Yahoo’s approach sounds much much more intelligent. What is the point of showing results for queries that are not even words. And by words I mean not only words, but just queries that almost have no results. Actually the best thing would be to show for these too, but after longer time of not spelling. This would mean that the user want to see results for this query. But even with this intelligent approach, I think that the instant search is something unnecessary. In most of the times I think that it is just getting in the way, and it is making useless queries and load for the server. I definitely vouch for Yahoo’s approach. I think most people will be kind of scared by Google instant because results are changing without them clicking anywhere. Users are used to click or press enter to execute a command. So in my opinion Google won’t go far with that. There will never be a massive worldwide rollout of this feature. I prefer Yahoo’s approach, sounds better than the way Google is doing it right now. I just hope Yahoo would not decide to use that pending application they have. Displaying instant results when only a full query has been entered certainly makes sense. I’m sure this would be much more efficient than calling results on every key press too (Yahoo doing their bit to help the environment?). It would also stop the big brand bias on single letter searches as well. Do you know of any patents Bing have applied for regarding instant search? I really hope that Yahoo stays as it is. I really don’t like Google Instant and I really hope that Google are going to close down that project like they did with Google Wave. I think the way Google set up instant search results can be distracting. This might be an area where less is more. I don’t believe that I need to see the search results for the first letter or two of most of my queries. I would guess that Google would like to try to show predictive results based upon what they might perceive as the intent behind a search rather than just on the search volumes related to those queries, but it’s quite possible that popularity may play more of a role in what is shown than matching an intent. The idea that Google might have turned on Google Instant as an attempt to have more businesses engage in paying for sponsored search results is something to think about. My initial thought was that Google Instant was intended to make Google appear much more responsive (and quicker) to searchers, and that seems to be what Google is focusing upon as a selling point for their new interface – how much time Google Instant saves searchers. But is it really saving them time? I’m not sure. Another technique to determine whether the not-yet-submitted search query is sufficiently well-formed to initiate a search is to determine if the search query matches or nearly matches a phrase in a dictionary that comprises pre-defined phrases. The pre-defined phrases may be phrases that are likely combinations of words in search requests. In one embodiment, the dictionary is based on popular queries. * In one embodiment, the dictionary is used to limit the number of search queries that are performed by determining if the not-yet-submitted search query matches, or nearly matches, a term or phrase in the dictionary, as a condition for performing a search. Yahoo’s implementation of Live Search back in 2005 did seem ahead of its time, and something that people might not have been ready for. It’s possible that it’s something that people aren’t ready for on Google in 2010 either. We have been evolving away from search based upon keyword matching alone, but is Google Instant (or Yahoo Instant) the right way to present search that’s based more upon meaning or semantics than a search interface that might better help let you drill down to results that help better define the intent behind your search? I’m not sure that it is. It does seem like Yahoo’s approach might be more user friendly. Will we see them launch an Instant search? I’m not sure. Interestingly, I’ve seen a few blog posts mentioning that Yahoo may have patented the idea of Instant Search ahead of Google, but the Google patent application I mentioned in my post Can Google Read Your Mind? Processing Predictive Queries was filed in 2004 and published in 2005, and is mentioned in correspondence between the US Patent Office and Yahoo regarding this Yahoo patent, which wasn’t filed until 2005. The Google patent filing describes the generation and use of dropdown search results, as originally seen in Google Suggest, but also notes that Google could update the actual search results while people are typing their queries into the search box. Some of the claims within that Google patent application were mentioned as possible reasons to issue a non-final rejection to original claims within this Yahoo patent (Speculative search result based on a not-yet-submitted search query). 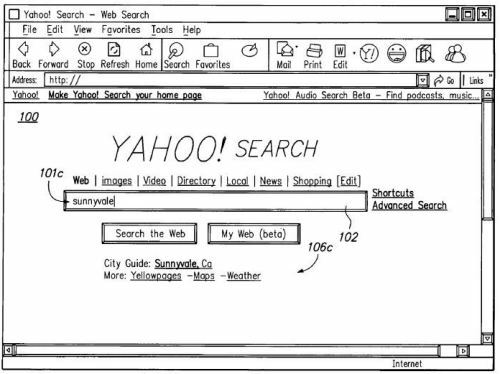 The original Yahoo patent claims were amended, with Yahoo arguing that their version of Instant Search was different from Google’s (or Microsoft’s). I like what I’ve read about Yahoo’s approach from the patent better, too. But the real test is in the implementation I think. And, if Yahoo decides to launch their own Instant search results, when would be the right time to do it? Should they jump on it now, or wait to see how it impacts search traffic at Google? If they can show an approach that seems to work smarter, would it be wise to do it now? I’m not quite sure that Instant search is necessary, either. I’m wondering, if Google comes to that conclusion too, is it possible for them to back out of using it in a graceful manner at this point? I’m not sure what Google’s deployment plans are for Instant Search at this point, but I would definitely be interested in seeing where it’s available now. Is it only available on the google.com domain? I’ve checked a few country-specific versions of Google such as Google UK, Google Canada, and Google Australia, and none of those are using Google Instant yet. Google does seem to be caching a lot of the results that we see early on in a query, for things like the first few letters that are typed into a search box – which can save on computational power and bandwidth. If Bing wanted to launch their own version of Instant search, they do have some intellectual property that could be developed to do so with. The filing date on that one is June 23, 2005. Working in the SEM and SEO industry, I have heard mixed reviews on Google Instant. There are those who are worried about its effects on rankings, their clients and what it means for SEO as a whole. But, for me, I am more concerned about what it means for overall users. Because that will overall effect who uses Google. Now I am not saying Google shot themselves in the foot with this, but the users that don’t like it and have turned it off may like Yahoo’s better. I think this could open up opportunities for Yahoo/Bing to gain more of the market. Why not let Google do all the experimenting and learn from their mistakes? Hey Nice and Detailed post! I must Thank you for that. On the other hand I guess let just accept that Google instant is more in the Googleâ€™s favor and from the users perspective its not much of a change. The Screenshots I can see above seems good and user friendly but as I have noticed Yahoo search over the time I think they are not going to come up with this kind of think and honestly if I would be on Yahoo I would never try that! And the reason is on Yahoo please are different as compare it to Google. On Yahoo people search for news, finance and most of the people on Yahoo donâ€™t like Google because itâ€™s too content stuff with no pictures and Yahoo is kinnda better in that. But this kind of instant is highly appreciate-able and I think to some extent Google should follow this! Why should Yahoo follow Google? Many people are complaining about Google’s instant search ( I have switched it off myself) it does not make sense for Yahoo to follow Google. Yahoo could do much better to work on its home page layout – which makes it more of an information provider than a search engine. People would love Yahoo (its Search technology is not bad) with simpler – GUI. I actually think this new process by Yahoo is definitely going to be better than Google’s current instant approach. While I love the ease and grandness of Google, the instant search is annoying. I’m trying to think of what I want to type letter by letter and I’m getting results for things that have nothing to do with what I want. I would prefer to type what I want, then see what comes up. This seems pretty obvious to me. Thank you for this article. Thats all I can say. You most definitely have made this blog into something special. You clearly know what you are doing, youve covered so many bases. I have to say that I think we should adopt a “wait and see” strategy to Google Instant. I think the idea is sound,but the practice to me seems a bit unnecessary?! I think that Yahoo should stay as they are, whats the point in always trying too follow your competitors? Let Google makes the mistakes first, like Wave and Buzz. Yahoo needs to another road. Well I think that it is possible to stop using it, as long as they get enough negative feedback. It is enough to just make it turned off by default too ;). But there is something else I heard. There a guy in a forum that said that google likes shorter queries, because they are very easy to process, and even if though they are so much more now, the servers could be less loaded. If this is true, they could have done this, just to reduce load time, while marketing the change like it is something great :). I’m not convinced that Google Instant is the right approach for Google to take either. I guess we are going to have to wait and see if they decide that it’s good for them. 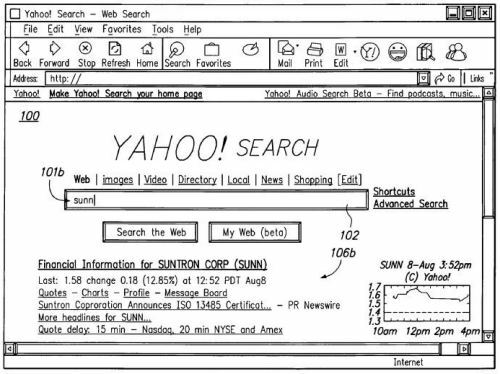 It is interesting that Yahoo has tried something like Instant search before, and now have a patent that describes how they might do it now, and appear to be holding off on implementing it. I think you’re right that learning from whatever mistakes Google might potentially make isn’t necessarily a bad idea. Question is, if it looks like Instant Search isn’t negatively impacting the number of searchers using Google, how long would you wait if you were Yahoo!? I can see the point you’re making, that people who appreciate Yahoo do so because it’s more like a portal than a text-based search engine, and if Yahoo starts looking and acting too much like Google they may make themselves less attractive to people who are their audience. Google’s instant might benefit from some restraint – updating search results with every new letter typed may not necessarily be an ideal approach. With Yahoo moved over to use Bing’s search database, I’m wondering if the question to ask is what is going to separate them enough from Bing to get people to continue to use Yahoo as a search engine. Would something like this version of Instant search do that? I don’t know. You may be right that focusing upon the user interface, as an information portal is the right answer in their competition against Google. I think your points raise the question, does instant search really provide value to searchers, and it’s something I’ve been pondering since Google Instant was launched. I think there’s been a loss of relevance in search results for intended queries as well – I really just want to type in what I want to search for and not see hundreds of possible results flash before my eyes. I don’t think that there’s a first mover advantage in being the first ones to implement Instant Search. Regardless of the differences between how Google and Yahoo might implement Instant Search, I’m not sure that it’s a good idea for them to do so either. Interesting point about shorter queries. My question though is that sometimes longer and more precise queries can be time savers because they might lead to answers that don’t appear for shorter queries. Are the gains in bandwidth in providing suggestions countered by people being mislead by possible distractions, and having to perform more searches? It seems to me that the main point of Google Instant is to create the perception of a more responsive and faster search engine, even if ultimately people may have to spend more time searching for what they want to find. As an SEO I am both excited and somewhat apprehensive by the advent of large-scale instant search. I can see a lot of less scrupulous vendors being tagged way earlier as words like “scam”, “rip off” or “complaint” pop into the searcher’s line of view whilst doing a simple background check on a given vendor. The democratization of information indeed! The query suggestions aspect of Google Instant has been around in one form or another since at least 2005, and those suggestions have been showing on the homepage of Google since 2008. It hints at the possibility of future legisation that might consider the impact of the kinds of suggestions that Google Suggest presents, especially when they might be harmful to individuals and businesses. Bill, I agree with you in this case that Yahoo! would be providing “less” in the way of distraction and “more” in the way of quality and relevance. Well personally i have not a perception of faster search engine. I think the people at Google have it ingrained into their mindsets that they have to keep showing that they are innovative. I’m not sure if that is true or not, but it might be. I think Google Instant creates more of a “perception” of increased speed more than an actual gain in helping searchers find what they are looking for faster. It does put some more focus upon the query suggestions that show up under the search box than they had previously. Thanks. We don’t know if Yahoo will eventually launch their own version of instant search, but I’d be just as happy to see them focus upon something else. Good point. I wonder how much of a negative impact Google Instant might be having on people who aren’t using broadband connections. Why was Yahoo’s instant search feature dropped, btw? I’ve actually discussed this on my blog recently. I believe those who are not one finger typists will simply turn off Google instant search just like I did. Frankly it’s not helpful in my searches, I find it a real hindrance. The only explanation that I’ve seen for Yahoo not continuing their live search experiment in 2005, which was never brought to the actual homepage of Yahoo, was that “searchers weren’t quite ready” for it. 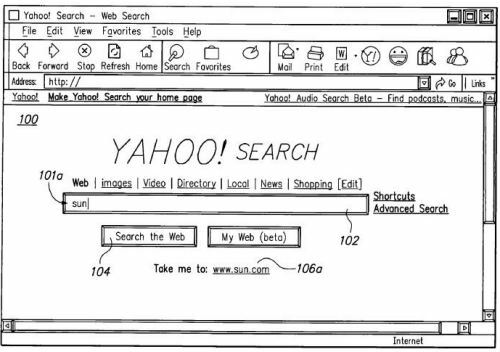 Maybe we’ll hear more of the story if Yahoo decides to launch the instant search described in this patent. Thanks for the link to your post. Google Suggest has been around for a fair amount of time, providing suggestions for queries on Google’s homepage since 2008. I’m wondering how much the live search results that Google is showing under Google Instant has influenced more people to select a suggestion. I’ve heard people saying either they really like Google Instant, or they really dislike it. It would be interesting to see how things like typing speed influences how receptive people are to instant results. I’m really not a fan of Google’s instant search, so personally I hope Yahoo don’t do one. I prefer Yahooâ€™s approach too but that’s another story @ Mike, you can easily disable “the monstrosity” that Google has created. It’s an optional feature. How? click on “Settings”, find “Google Instant” and select “Do not use Google Instant”. I’m not quite sure that Yahoo will at this point. They made an interesting announcement yesterday about enhancements to their search interface that seem to provide more of an “experience” than a set of search results, includin things like slideshows in those results. An instant search type interaction to go with this like that might be overwhelming. Thanks for pointing out the way to disable Google Instant for those who don’t want to see it. I feel that instant search is useful and cuts down typing time and getting to your results faster. SEO wise i dont think it will make a major impact and dont think it puts off what people where already going to visit. People are lazy browsing the internet and this is what google instant is all about cutting out time and effort. I still have some mixed feelings about how much of an impact Google Instant will have upon SEO, but it’s interesting seeing how people respond to it. I don’t know if updated search results offer too much more than the query suggestions that Google already has been showing, but Instant does make it easier to see examples of the kinds of results that might be found when searching for those suggestions, and that could be useful to many searchers. The good news, at least, is that you can turn Google Instant off if you don’t like it. I’m wondering how many people actually use Google’s Instant Preview myself. Ask.com had a similar feature for years, with their binoculars, which drew very little attention to itself, but allowed visitors to take a glimpse at a site before visiting in person. yes, I remember the ASK model, it was very similar – I had forgotten all about ot – probably because it was that insignificant and didn’t grab my attention. I guess you are right, but I would imagine that this was simply down to their PR machine (or not?!) at ASK, and the capital which Google makes out of all its new gimmicks, would you think? Every time they create a new gadget/gizmo/widget etc., the whole world knows about it – and is interested because it is the mighty Google! I imagine that the people at Google spent a little time looking at how Ask had implemented their binoculars when deciding how best to implement the Instant Search Previews, but ask really didn’t get much press coverage or commentary on the Web when they released their preview feature the way that Google has. Google does seem to be at the point where they don’t need to do a lot to publicize new fetures or products – people will do a lot of that for them, from the press to bloggers to people who use their services and others. I don’t think ask.com has never quite reached that level. Googles instant search is there to benefit their adwords business. as your instant results are displayed so are the most targetted highest bidding ads. you click those google gets more revenue. I’m a little torn over the ability of Google Instant Search to earn the search engine more revenue. One of the “innovations” of Google’s advertising system is that the ads that are shown to viewers are relevant to the query that they perform and the informational or transactional need that they might have. If the Google Instant results shown to searchers are they are typing aren’t relevant to that need until the query is completed, then searchers are being subjected to sponsored ads that aren’t relevant to what they are looking for, and the chances of those ads being clicked upon is minimal. Well, Yahooâ€™s approach sounds much much more intelligent than Google’s. What is the point of showing results for queries that are not even words. And by words I mean not only words, but just queries that almost have no results. Actually the best thing would be to show for these too, but after longer time of not spelling. This would mean that the user want to see results for this query. But even with this intelligent approach, I think that the instant search is something unnecessary. In most of the times I think that it is just getting in the way, and it is making useless queries and load for the server. There are a number of things that I like about Yahoo’s approach, but I’m not a big fan of instant results either. When I search I don’t like instant results. I like being able to finish typing my thought and then get the results. Instant results are kind of like cutting off someone when they are trying to tell you something, it is just rude. Andy did have a point that returning results based upon nonsense is just pointless and there Yahoo would win. I’m pretty much at the point where I ignore the suggested queries in instant results, much in the same way that people develop banner blindness and don’t see the big banner advertisements that are shown on many sites. But I understand what you mean. The Yahoo approach to limiting results shown in response to some suggested queries does seem to make some sense. I do like that aspect of what their instant results might be like. While Microsoft does run the database of web page information that Yahoo uses these days, I don’t think that would stop Yahoo from presenting instant results like this if they wanted to. I have to agree with David, on his earlier point that the only winner here, as is often the case, is Google. Having said this with the advent of the double arrow by the description to my site, I do find people are more aware of the ability to preview it. This may hinder or promote the clicks through to my site dependent upon the viewer reaction to the screenshot presented to them, don’t you think? Previous Previous post: Google Instant: Tradeoffs Include Less Implied Local Results? Next Next post: Bad Dates in Google Snippets: Hey Google, I’ve Blogged a Little Since 2005!